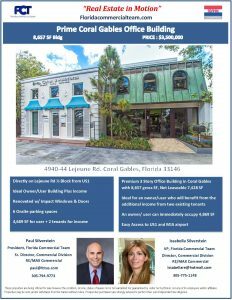 sent this this elegant & charming three story Coral Gables office building ideally located directly on Lejeune road, only one half block from South Dixie Highway. 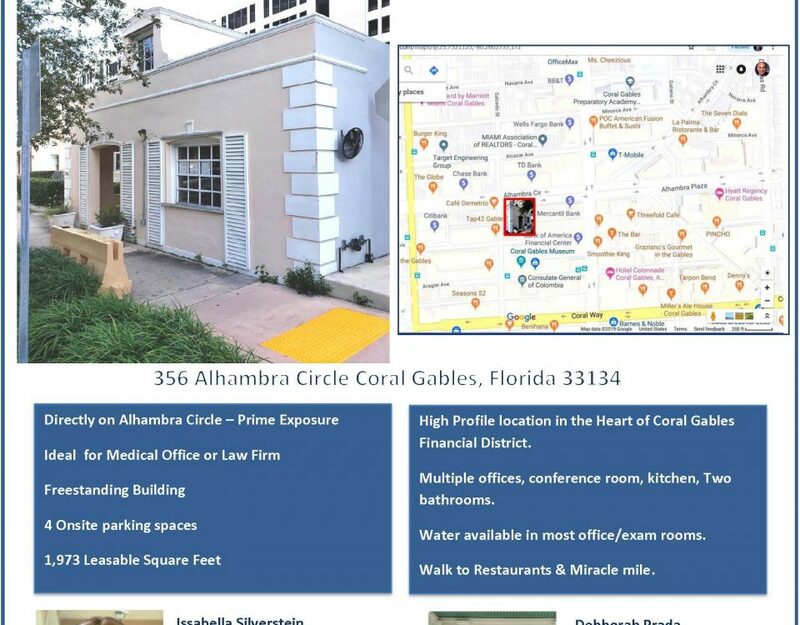 This attractive building is located adjacent to one of the best Coral Gables residential neighborhoods , is just steps to Merrick Park and yet only five minutes to the Downtown Financial District. 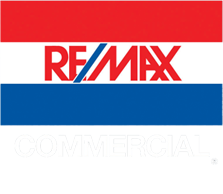 The adjusted building square footage measures 7,428 SF per tax roll, however the gross square footage is 8,657 square feet. It is comprised of a three story main office building, currently used as an architectural office, and an adjacent single story structure currently used as a fitness studio. It has been completely renovated, including hurricane impact windows and doors, and has been meticulously maintained. There is 6 Car parking onsite, with additional free parking within a block of the Property. The first floor consists of a lobby, seven offices, a large storage room, lunchroom and bathroom. The photography studio tenant occupies 720 SF of the first floor. 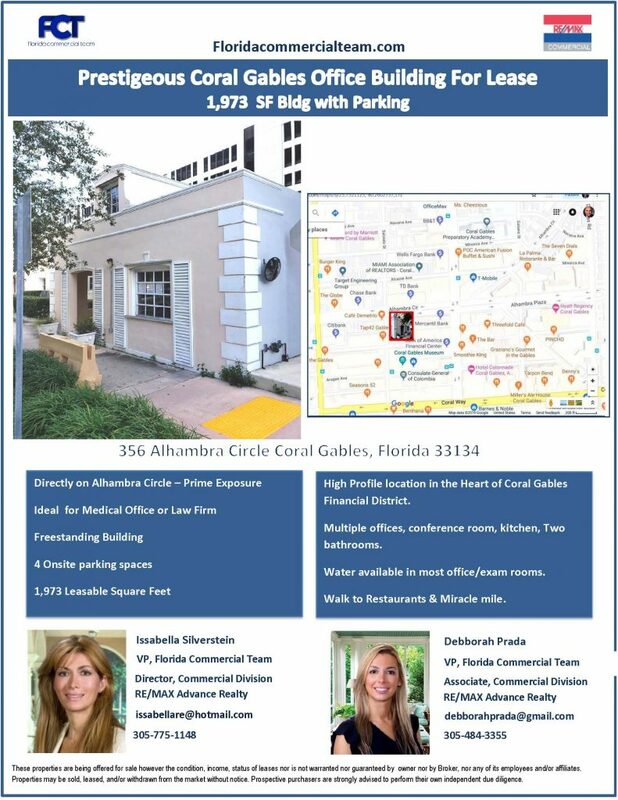 The second floor has a reception area, lobby, conference room, front desk office, three large open office spaces, three bathrooms and a lunchroom. This space is occupied by the architectural firm. There is a handicap lift for access to the second floor. The third floor, which is accessed by two stairways, is comprised of a large open office area, breakroom and restroom. 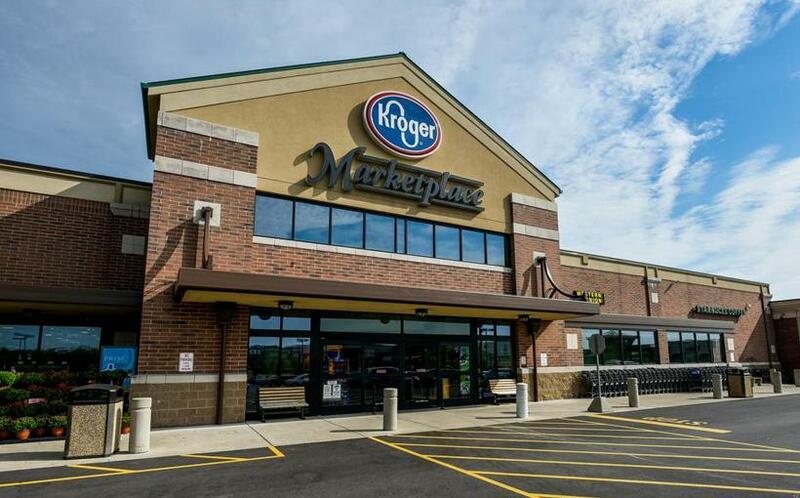 This property is ideal for an owner/user who also seeks additional income from existing tenants while occupying 5,000 square feet.